BERLIN, September 14. /TASS/. The legitimacy of a number of the Council of Europe structures formed on the basis of elections at PACE will look questionable for Russia if the Russian parliamentary delegation is not fully reinstated within PACE, Russian Foreign Minister Sergey Lavrov said on Friday. By now, "more than a half of judges of the European Court of Human Rights, who are elected by PACE, have been elected without Russia’s delegation," he noted. "Then, PACE held voting on the Commissioner for Human Rights, and Mrs Dunja Mijatovic was elected, again without the Russian delegation. 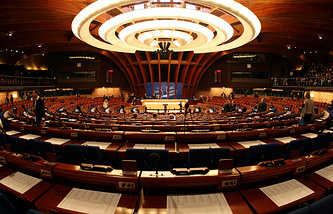 Next year will see the election of the Council of Europe’s Secretary General. If by that time, this problem is not resolved, the legitimacy of these structures of the Council of Europe will be highly questionable for us." "What is going on in PACE only adds to the problem of the shortage of [European] forums, because the aggressive Russophobic minority in PACE is sparing no effort so that this forum cease to be a common European one," Lavrov stressed. According to the Russian top diplomat, Moscow responded to the criticism for non-payment of its contribution and a threat of being expelled from the Council of Europe back in the summer. "We said that as soon as the Council of Europe’s Statute and Charter are observed, as soon as our parliamentary delegation is reinstated in its rights without any reservations, we will pay everything due to the Council of Europe immediately," he said. "This position is in force," the Russian foreign minister underscored. "It is now up to the lawmakers to demonstrate a constructive approach. And if those who seek to punish Russia for all and everything - we know the countries that want to do it - manipulate the entire PACE, then it will do no credit to lawmakers from other countries, which are interested in dialogue on the most acute matters, such as Crimea, the crisis in Ukraine, migration problems and others." In April 2014, the Russian delegation to PACE was stripped of key rights, including the right to vote and take part in the assembly’s governing bodies, following the developments in Ukraine and Crimea’s reunification with Russia. The issue of restoring the rights of the Russian delegation was raised at PACE twice throughout 2015 but the sanctions are still in place: Russia is deprived of the right to vote and cannot take part in the Assembly’s governing bodies and elections monitoring missions. In response, Russia suspended its participation in the PACE activities till the end of 2015. In 2016-2017, Russia skipped PACE meetings due to the ongoing sanctions. In late June 2017, Russia said it was suspending payment of its contribution to the Council of Europe over its non-participation in PACE. Concurrently, it suggested PACE’s regulations be amended to ensure that no one could deprive the lawmakers of their rights but for their voters. On January 11, 2018, chairman of the State Duma )lower parliament house) international committee, Leonid Slutsky, confirmed that Russia would not apply for confirmation of its rights for 2018.